First of all – Congratulations on your engagement! This is an exciting time for you both and you’re probably now thinking…what next? Before you continue please remember that this is simply a guide, timings and everything else need to suit you and it is important you don’t panic if you don’t get your invites out at the recommended time! It’s your wedding – your rules. Save The Dates are a popular option for couples who have booked their wedding venue a year or more in advance. If you have your venue and date confirmed, there is no harm in sending out your Save The Dates straight away to give your guests as much notice as possible, to ensure that everyone you want to be there can be. Others may suggest sending your Save The Dates out around 6-8 months in advance, but from experience we find that sending them out a little earlier, if you can, is a good option. Save The Dates aren’t a necessity, and if you have booked your venue with less than a year to go, we suggest skipping the Save The Dates and focus straight onto your invitations (only if you want to!). 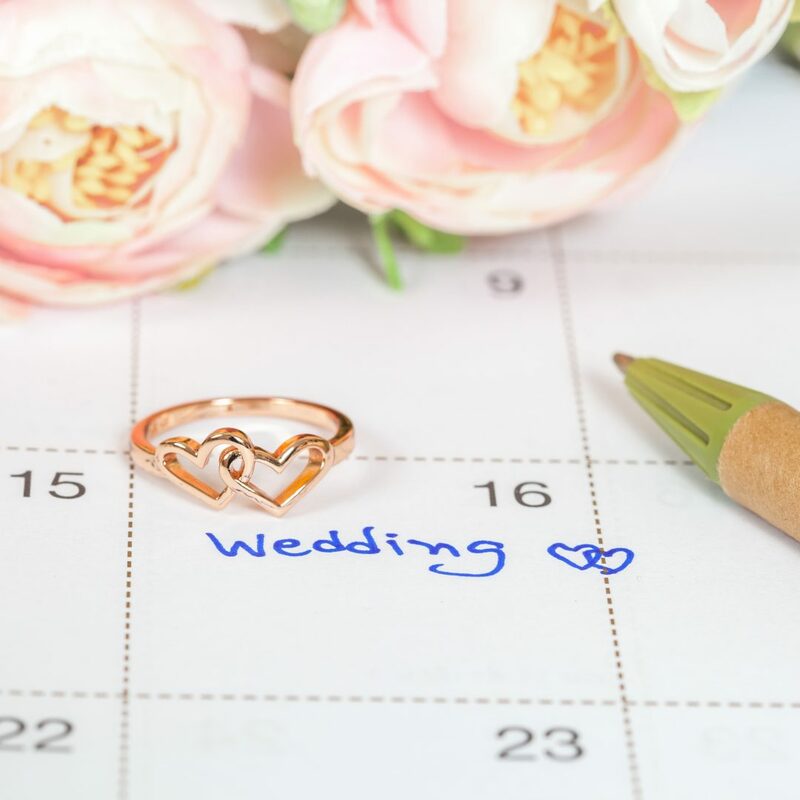 If you do opt for no Save The Date, we advise sending out your wedding invitations 6-8 months before the wedding, however if you have sent out Save The Dates, you can always hold off a little longer and send around 3 months before the wedding. Getting your on the day stationery ready will typically depend on your RSVP’s. We advise setting your RSVP date 8 weeks before the wedding so that you have 8 weeks to get your order of service/order of the day , table plan, table numbers, place cards and menus in order for the wedding day. If you wanted to start planning earlier, an option could be to simply hold off confirming the finer details like your guests names and final quantities until you receive your replies. Here at Love Invited we only need a maximum of 4 weeks to get everything ready for you, but there is no harm in starting earlier! Another thing to always consider is whether your wedding falls within school holidays or at Christmas. If it does, you may want to give your guests (and the postman) a little bit more of a heads up so everyone can plan in advance and make sure they can attend. If you need any more information on timings & your wedding stationery please feel free to get in touch– we are more than happy to help! Previous post: Make Your Stationery Shine!